A new documentary film charting how John Hume created the framework for peace in Northern Ireland is to be premiered at the Galway Film Festival this week. Narrated by actor Liam Neeson, the film includes wide-ranging interviews with former US Presidents Bill Clinton and Jimmy Carter, and British Prime Ministers John Major and Tony Blair. 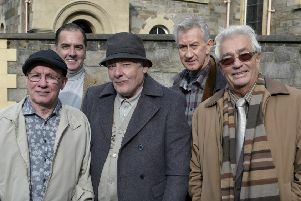 It is directed by Maurice Fitzpatrick, the man behind the acclaimed ‘The Boys of St. Columb’s’ - a film about several famous alumni of St Columb’s College in Derry. With original composition by Bill Whelan, “In the Name of Peace: John Hume in America” is the story of the extraordinary work of the Nobel laureate to harness and leverage US support to help to secure peace in Northern Ireland. Through the relationships he cultivated with the White House and US Congress, John Hume, concludes the film, created the framework for peace in Northern Ireland. The documentary also includes contributions from U2 singer Bono, Sinn Fein’s Gerry Adams, Sir Jeffrey Donaldson, of the DUP and journalist Eamonn McCann. Thursday’s premiere will be followed by a panel discussion featuring Bertie Ahern.